Waterfront canal, lagoon and riverfront homes are popular with people who wish to live a waterfront lifestyle on a limited budget. In years past, the dredging of Florida canals and the filling of wetlands was common place. Before strict environmental controls went into effect, developers were allowed to dredge new canals to give more homeowners waterfront access to the lakes. Today, dredging a new canal is out of the question and re-dredging an existing canal is strictly controlled. 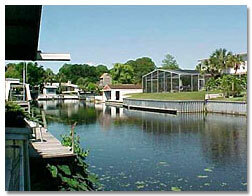 A waterfront canal home can be a real bargain, providing you are aware of the rules and potential problems. The most important factors when considering canal front property are the depth of the canal and the distance from the lake. Many canals are extremely shallow during times of drought. This is normally not a problem to the owner of a small boat where the motor can be trimmed up, but inboard boat owners should use caution. Also, some canals have long idling distances before you can enter the lake and get on a plane. Water depth in a specific canal can be hard to ascertain and is not generally known by Realtors. Many people have purchased canal front property in periods of high water only to find their boat high and dry a few years later. 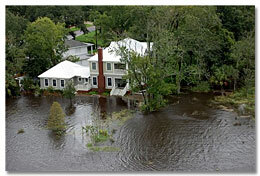 Other types of waterfront property are lagoon and river front property. Lagoons are similar to canals except they are wider and normally do not have a clear view of the main lake. The same low water cautions as canal homes apply to lagoons. Riverfront homes have the additional problem of too much water. For example, the St. John's River carries the rain water for most of the Central and Northeastern Florida. In bad hurricane years, this river commonly floods it's banks. Sometimes the river is shut down to keep boat wakes from rolling into riverfront homes. In worst cases, the river actually floods the homes and covers wide areas. Long time river residents know about this and have learned to adapt. If you have questions about Florida lake, canal, lagoon or river homes, please contact us.